DID JOHN MCAFEE KILL GREGORY FAULL? The case against John McAfee for the death of Gregory Faull has been based, since the beginning, on innuendo and accusations, and nothing more. Before rushing to judgement, as Mr. Faull's family and countless others have done, consider the following facts, supported by evidence. John McAfee is never been charged with the death of Gregory Faull in any criminal proceeding. The police in Belize have never named or described McAfee as a suspect, and have detained others in connection with the crime. Raphael Martinez, a spokesman for the National Police in Belize, has stated on the record that McAfee was "not a suspect." 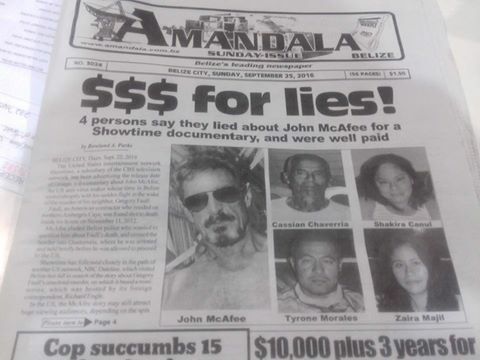 Witnesses from Belize have filed affadavits stating they were bribed to lie about McAfee and claim his involvement. The judge in the Florida civil case brought against McAfee originally denied the default judgement "saying the allegations were not supported by the facts." In the 7 years since McAfee left Belize, no attempt has been made to charge extradite him for any crime. 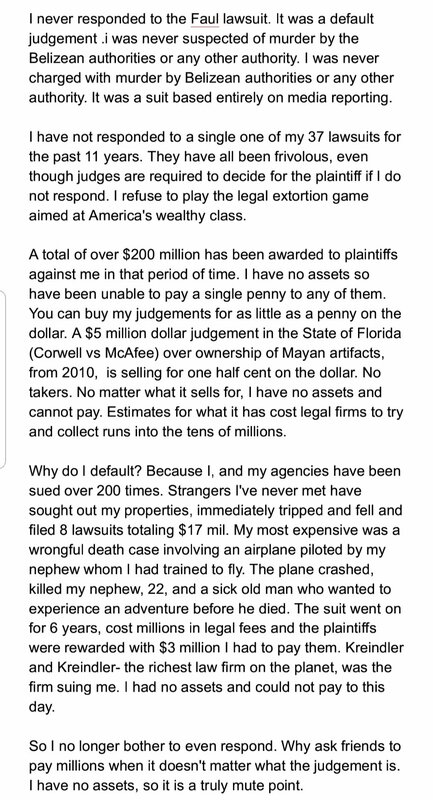 In his reply to the media following the default judgement, McAfee describes why he refused to defend himself against these allegations in civil court. Despite his refusal to show up, the judge ruled that the facts were not supported by the evidence. An appeals cout overruled him, stating that because McAfee did not defend himself, he must consider the facts to be true. Justice? Evidence against these allegations, and against the smear campaign that has been waged against McAfee, has been collected at showtimegringo.com and can be viewed by anyone. Before assuming you know the truth, before presuming to speak on the matter at all, the right thing to do is to look at all of the evidence. If you do, you can only reach one conclusion: somebody else killed Gregory Faull.